We start turkeys in the spring under grow lights. The post office delivers them, and the boxes have a different sound than our regular poultry deliveries. They spend a bit of time in the brooder, then out into their field pens. By the end of July we have a pretty good idea of how many birds we have, and in August we begin to really take orders: notice goes on the board at market, in the monthly email and on the website. At market, some people stand astonished that turkey orders can take place in August. They will ask "really? already? ", shake their heads and walk away. 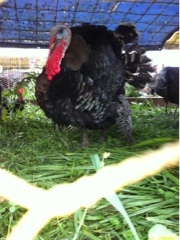 Others realize that this turkey we grow is not like many others. The numbers are extraordinarily limited: less than 100. I'm not really a fan of turkey. Until eating ours, and realizing what a difference there can be in turkeys. And the gravy, made with stock from the feet, yum. As always, we keep the scratch and dent birds for us. Last year we had a group of college students buy a bird the week before Thanksgiving proper, they paid with ones and fives, took the bird back and had a feast with their friends. Second year that has happened, and a tradition we love. The vision of each friend finding their $5 each to put towards that big meal just makes us happy. This week, so far, we have taken deposits on close to 10 birds. Combined with people who send us checks on January 1, we are well on the way for 2013. While it might be odd to think about turkey dinner in August, we do sell out of birds every year. Each year the sold out date gets further into October and less in November. We only have them until sold out. Preorders only. Because we keep the scratch and dents for ourselves and enjoy delicious turkey all year. $6 per pound, $40 deposit needed to hold each one.